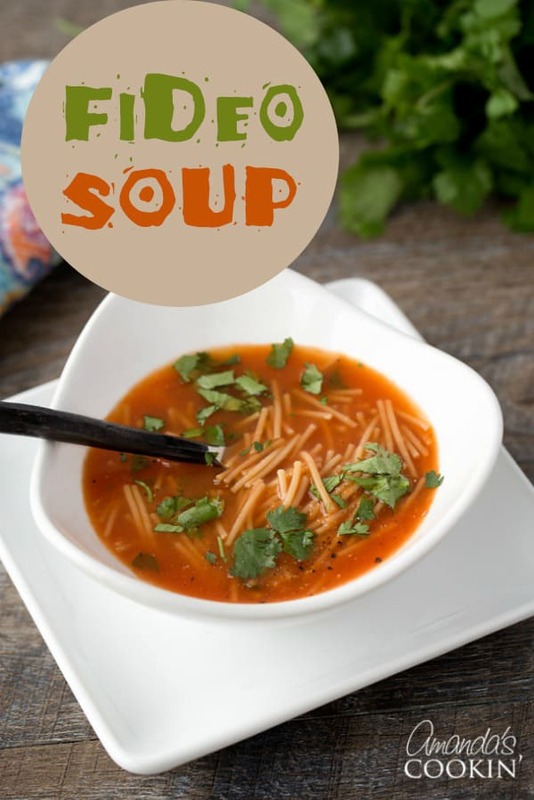 Mexican Noodle Soup, Sopa de Fideos: a flavorful cup of soup! This Mexican Noodle Soup is my version of the classic Sopa de Fideos, you can easily make this fideo soup at home with a handful of tasty ingredients. 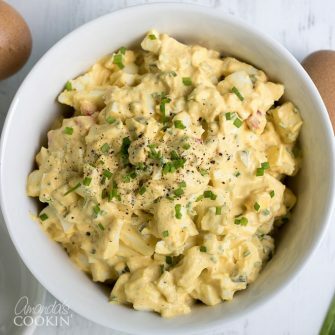 It’s bursting with delicious flavors, just begging you to make it! 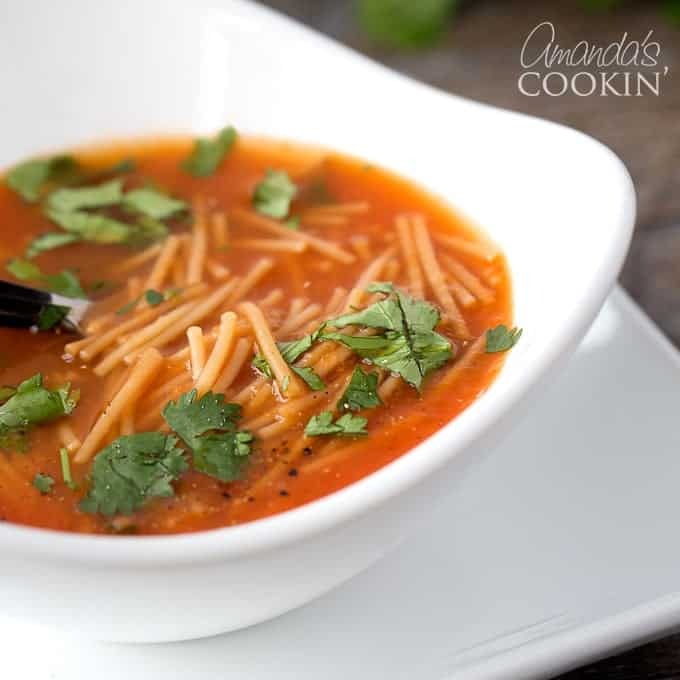 This classic reminds me of one of our most popular soup recipes, Italian Sausage Tomato Orzo Soup but with different pops of flavor, these two soups make my favorite list! I love Mexican food. The flavors are wonderful and everything always smells so good, I just can’t resist it! I’ve been to many Mexican restaurants and they seem to always give you a small cup of Sopa de Fideos (noodle soup) before the meal. So I scoured the internet and viewed tons of recipes discovering that the basic recipe for fideo soup is pretty much the same. 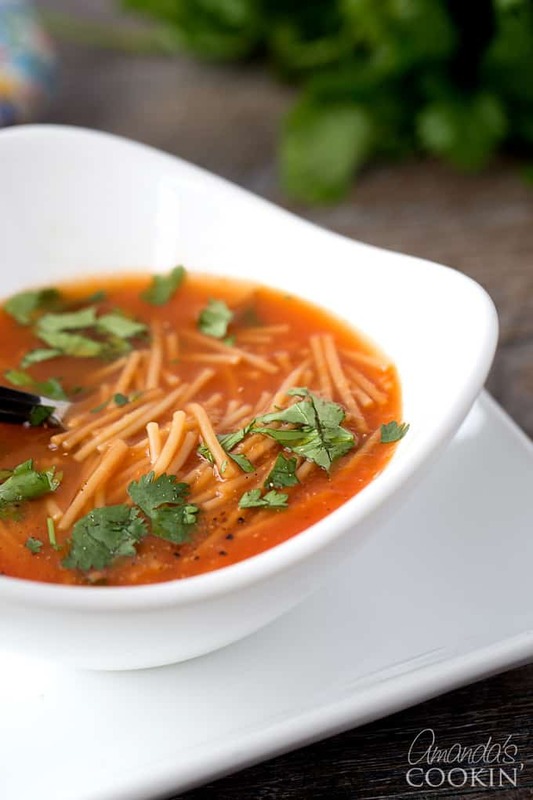 My kids love this Mexican noodle soup as well, in fact when my daughter was sick a couple years ago I brought her a pot of this fideo soup and she was over the moon. It’s so flavorful and warming, it’s really that comforting! Want more amazing soup recipes? Try this delicious Smoky Romesco Soup, Rustic Garlic Potato Soup, Vegetable Rice Soup, this Cream of Asparagus Soup, or this Chipotle Chicken Soup. Fideo is the Spanish word for noodle and sopa translates to soup. You can find small packages of fideo in the ethnic aisle of your local grocery store. You can also use thin spaghetti noodles. Simply break them into small pieces about an inch or two long first. You can use your favorite brand of diced canned tomatoes, I actually prefer to use a fire roasted flavor for this recipe. This recipe calls for canned or boxed chicken broth, but many families like to use water and bouillon. The brand I’ve seen used most often for this soup is Knorr, but your favorite brand will also work great. If you make your own chicken stock, use 6 cups for this recipe. Don’t skip the fresh cilantro in this recipe. The flavor of the cilantro really makes this soup and it wouldn’t be the same without it. You can get a fresh bunch of cilantro at your local grocer for around a dollar, and you can make fresh salsa using what you have left over! You can also chop your remaining cilantro and freeze it in ice cube trays by filling each compartment with fresh cilantro and some water. You don’t really need special equipment for this recipe, though a blender is very helpful. You could also blend the ingredients in a food processor or use an immersion blender. 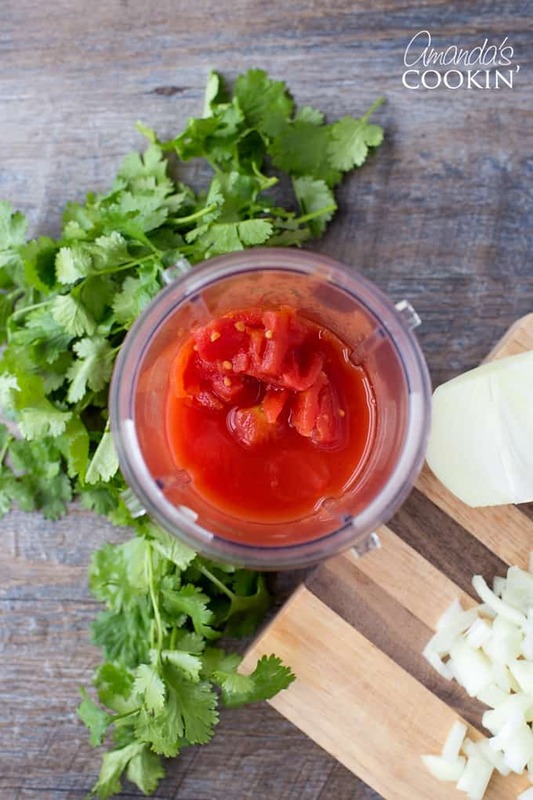 Combine canned tomatoes, onion and garlic in a blender. Blend until smooth. Warm olive oil in a medium skillet and add fideo noodles. Cook over medium-low heat, stirring regularly, until all pasta noodles are golden brown. Remove from heat. Combine tomato mixture, chicken broth and the noodles in a medium saucepan. Season with pepper and salt. Bring to a boil then reduce to medium (gentle boil) until noodles are almost tender, about 7-8 minutes. Add chopped cilantro and cook 2 more minutes or until noodles are done. There you have it! A delicious pot of Mexican Noodle Soup, a tasty dinner recipe perfect for any night of the week. 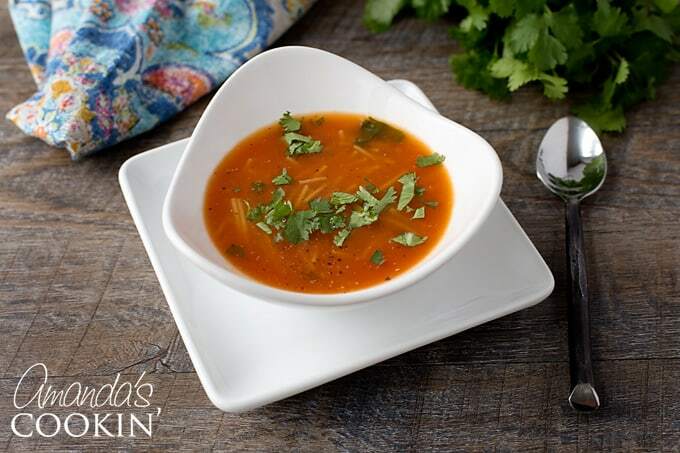 Serve this soup with this Mexican Inspired Sangria for an even tastier experience! And for dessert, these Mexican Chocolate Cupcakes seal the deal. I hope you enjoy! This post was originally published on this blog on Feb 9, 2009. This Mexican Noodle Soup is my take on the classic Sopa de Fideos. You can easily make this soup at home with a handful of tasty ingredients! Warm olive oil in a medium skillet and add fideo noodles. Cook over medium low heat, stirrly regularly, until all pasta noodles are golden brown. Remove from heat. Add chopped cilantro and cook 2 more minutes or until noodles are done. I have a few bags of fideo in my pantry, and with this crazy winter blast that just hit Houston Tx, i am thinking a nice warm bowl of fideo will hit the spot! Thanks for the simple recipe! We love this soup here, how you enjoy it! I love it this way. I do add black olives sliced while cooking. Then avocado after to serve. Delicious! Your Mexican noodle soup looks comforting. Also, it appears hearty enough to be the main course. Thanks for sharing. This soup was awesome! I don’t like cilantro so I left it out, I used green onion. This was liked by my family of 4, which is a challenge. This soup turned out great! So easy to put together and my son loved it! So glad you enjoyed it Tara! very tasty, but I would use only half to 3/4 the bag of noodles. using the whole bad made it reall thick. 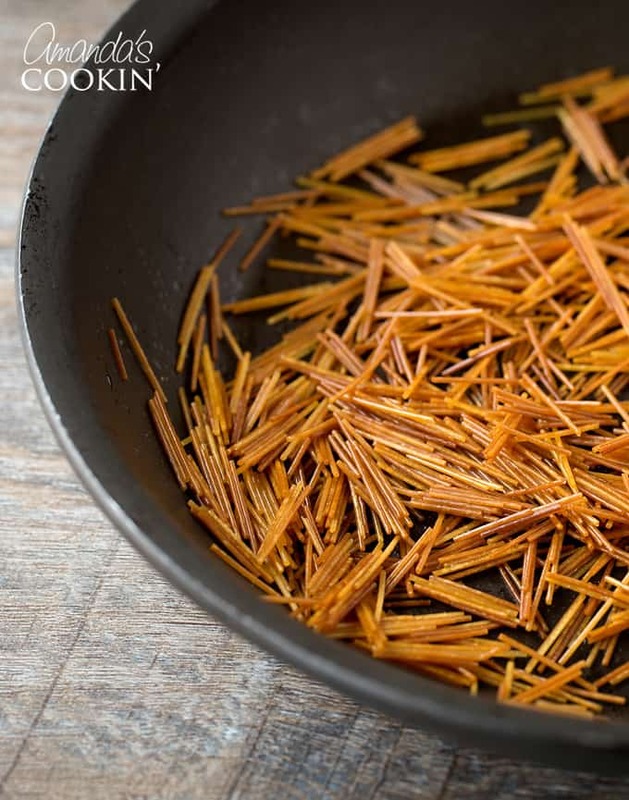 I’ve seen simple versions of Sopa de Fideos and more complicated versions that involve roasting and pureeing the tomatoes, sauteing the onions and garlic in chorizo oil….SHEESH! This is supposed to be a simple dish. Your recipe looks very easy and involves a lot of the traditional elements. Like most Mexican dishes, there are regional variations. This is a dish that everyone’s Tia or Abeula made and there’s a lot of room for personalization. I can’t wait to try this! I hope you like it! it’s really one of my favorites, adding in the cilantro at the end is a must. Love! I love, love, love sopa de fideos!!! It makes for a great soup, especially when the kiddos are sick or for whenever the craving for some hits! I love to watch my 2 year old slurp the noodles up, its so cute! :) I also like to add veggies and chicken as well. I agree, I always have homemade broth in my freezer :) Love this soup too and make it often! 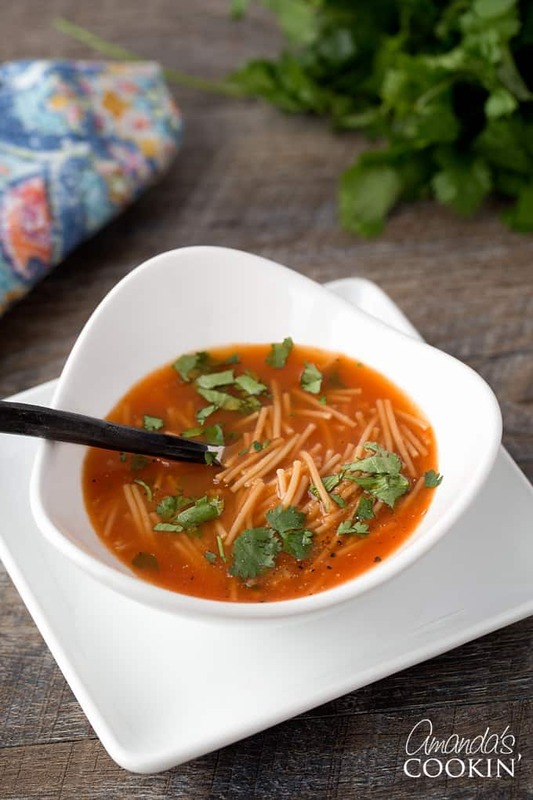 Sopa de Fideo is such a simple recipe, but one of my very favorites! Love love love it! Going to prepare it for dinner tonite! Mmmmm! I am drooling just thinking about dishing this up tonight. Thanks for the recipe! Love this soup just finished making it …. Simple and easy . My husband needed a little homestyle comfort food. Thanks!